Accenture is back on top of this month’s Services Index. EDS has been shoved into second place and CSC has ousted Unisys for third position. Otherwise, there is little change in the top 25. However, if you look a little further down the list, Patni has had a terrific month climbing 8 positions. It is probably still flush from its successes at the recent “CIO Symposium and Award Ceremony” which was the first one to be held in India. BT Global Services has also scaled a tidy five positions in the rankings following their acquisition of Counterpane Internet Security. In fact, yesterday, it announced a £126million contract with Atos Origin to provide a managed network service for the Department of Constitutional Affairs. No surprises then to find that Atos Origin is up 3 positions as is Verio. Siemens Business Services has recovered from its dramatic fall last month and is up four spots. On the down side, Verisign has dropped seven positions and Xansa has dropped six positions. 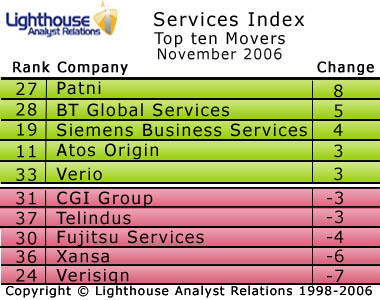 Fujitsu Services has also fallen this month and in fact has dropped out of the top 25. Telindus is also down as is CGI Group.